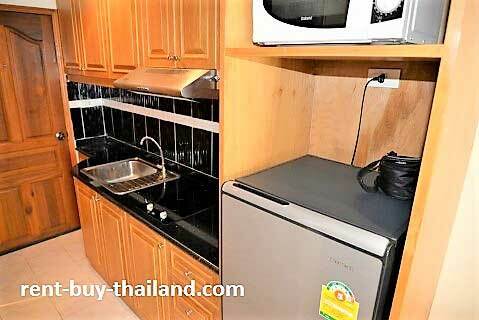 Rental Price 14,000 - 23,000 Thai Baht per month depending on season and length of stay. This is a lovely fully furnished studio apartment on the eighth floor at Jomtien Beach Condominium A1 which boasts sea and pool views and is within a very short walking distance of Jomtien Beach. The apartment consists of open plan accommodation consisting of living, kitchen and sleeping areas with a separate bathroom and a balcony. Being fully and stylishly furnished it is ready for you to move in. The modern kitchen is of a European style and is fully equipped with pots and pans, crockery and cutlery etc., along with an electric hob, extractor fan, toaster, hot water kettle, microwave and refrigerator. The main living area contains a double bed, plenty of storage space including a large built-in double wardrobe, drawers, and bedside tables; a sofa, a coffee table and a flat screen TV and DVD player. There is also a desk and chair providing work-space and access to the balcony via large sliding doors. The modern bathroom is fully tiled and includes a basin, toilet, storage facilities and a walk-in shower. There is also a balcony, which includes balcony furniture and provides lovely pool and sea views. 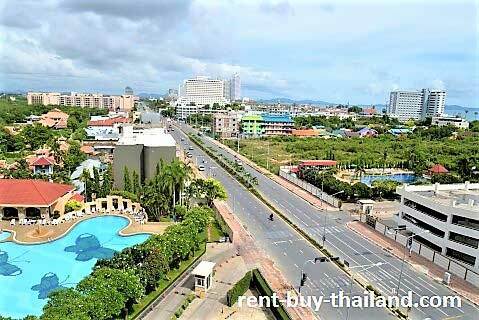 Jomtien Beach Condominium is close to Jomtien Beach, and there are numerous amenities in the area, including bars, restaurants and shops. There are some great facilities available for residents, including: a huge swimming pool, fitness center, table tennis, massage parlor, mini mart, restaurants & bars, laundry service, parking and 24 hour security. Other condos around the area all are available on condo finance please inquire for further details.